Location: This trail is accessed from the Pea Creek Trail by crossing the creek on a footbridge. This self-guided nature trail has information stations posted about Eno River ecology. 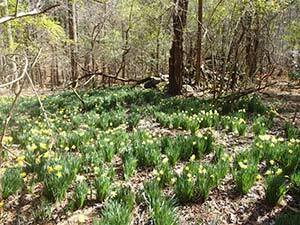 Location: This trail is accessed by hiking the Cox Mountain Trail from the picnic area north to the Fanny’s Ford loop. 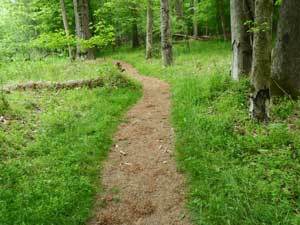 This trail is a 1.01-mile loop but the round trip from the picnic area is 2.85 miles. The hike is generally easy with gentle hills and flat terrain along the river. This 2.6-mile combination of two loops continues west from the Buckquarter Creek Trail from a bridge spanning the creek. Round trip from the Piper-Cox House parking lot is 4.1 miles. The smaller western loop is an easy hike around the stone remains of Holden’s Mill. The river segment is characterized by rock outcrops, giant boulders and frequent rapids. Knight and Piedmont trails are primarily accesses for neighborhoods off Pleasant Green Rd. but any hiker may use them. The Knight Trail turns east off Ridge Trail and goes up a steep hill 0.34-mile to the park boundary. The Piedmont Trail is 0.18-mile of utility right-of –way which crosses the Knight Trail. There is no parking access to these trails. This trail exits the park. Enter private property with permission only.